Oh, sure. Going to “finish a sock or a sweater”, I said. “All week to knit” I said. I should have known that as soon as I made such plans for myself, my brain would do an about-face and say, “no, maybe not so much.” The kitties were darling and would have happily allowed me all the knitting I pleased. At the beginning of the week I had 1 unfinished sweater and 1 unfinished pair of socks. Now on Saturday I still have 1 unfinished sweater and 1 unfinished pair of socks, although the socks are arguably close, since I have turned the 2nd heel and need to only do the foot. I have also been enjoying a return to Reading Books. (Did you know you can read books? You just get a book and then you read it. And then when you finish it you can read another one. Groovy). I’ve spent the last couple of months tearing through paperbacks and have lately been moving into the contemporary literature area, ranging from the “OMG someone actually published this?” (The Friday Night Knitting Club was sadly not for me) to the “OMG why have I not been reading this sooner?” (Jasper Fforde and the ‘Thursday Next’ novels). 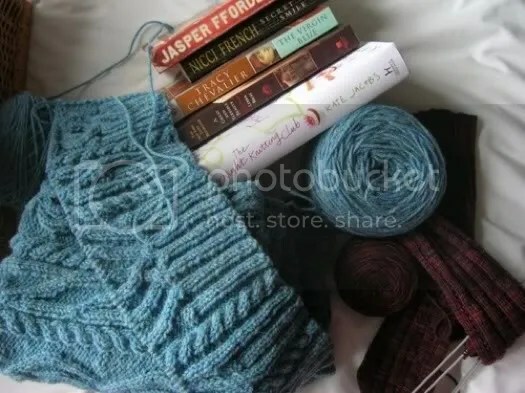 It’s a shame cables don’t make good movie knitting though, because I tells ya, this Halcyon sweater has been on the books too long – I note that i cast on in April which is now at least 3 months ago. Come ooooon, cables. It’s you and me. Let’s finish this sucker. Next post: Either the WIPs will have the glory, or I will. Coming soon to a suspense-filled blog read near you. Have a great weekend! I felt EXACTLY the same way about the Friday Night Knitting Club. I’ll have to take your reccommendations about the books you enjoyed. Good luck with the cables! I have not been as good lately about doing my WIPs either…. seems there is always something else calling my name. Good luck with yours! I agree with you on the FNKC and the Jasper Fforde! Can I recommend The Time Traveller’s Wife if you haven’t read it already. It’s an absolutely beautiful book. The trouble is I can’t read and knit- I cannever find the books I want to read on tape or CD!! The Fforde books are excellent!!! Good luck with the cables!! Oh dear god, don’t see Mamma Mia. Seriously, don’t. James Bond sings. Badly. Don’t be blinded by Meryl Streep in the leading role. If you’re anything like me, you’ll have to break up with Colin Firth after you see this. Even my friend who loves all this both musical and ABBA said it was awful and she was sorry we spent money on it. Personally, I’d rather have seen Batman myself. You know, just sayin’ is all. Happy upcoming birthday! (I’ll be gone most of next week, so thought I’d better say it now.) I agreed about FNKC; it just did nothing for me at all. I know you are on a roll with those sock – you can do it!! I LOVE the Thursday Next books! I’m trying to get more people to pick them up. Glad you like them!